U.S. healthcare transportation services market expected to reach USD 31.51 billion globally by 2026, at a CAGR of around 4.23% between 2018 and 2026. Transportation services in the healthcare sector act as an aid to ensure the safe and timely transfer of patients, medicines, medical equipment, and test specimens from one location to another. The report analyzes and forecasts the healthcare transportation services market in the U.S. on the country level. The study offers past data for 2016 and 2017 along with forecast from 2018 to 2026 based on revenue (USD Billion). 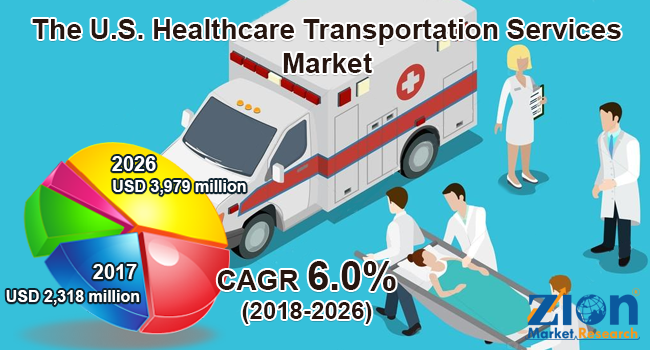 Assessment of healthcare transportation services market dynamics gives a brief thought about the drivers and restraints for the healthcare transportation services market along with the impact they have on the demand over the years to come. Additionally, the report also includes the study of opportunities available in the healthcare transportation services market on the U.S. level. The report gives a transparent view of the healthcare transportation services market. We have included a detailed competitive scenario and portfolio of leading vendors operative in the U.S. healthcare transportation services market. To understand the competitive landscape in the healthcare transportation services market, an analysis of Porter’s Five Forces model for the healthcare transportation services market has also been included. The study encompasses a market attractiveness analysis, wherein the type and end-users segments are benchmarked based on their market size, growth rate, and general attractiveness. The study provides a crucial view of the healthcare transportation services market by segmenting the market based on type, product, application, and countries. All the segments of healthcare transportation services market have been analyzed based on present and future trends and the market is estimated from 2018 to 2026. Based on the type, the U.S. healthcare transportation services market is segmented on the basis of type and end-users. The two types of healthcare transportation services are medical transportation and non-medical transportation. Medical transportation is sub-segmented into medical products, incubator transport, mobile treatment facilities, and patient transport. The patient transport segment is again classified into emergency, non-emergency, mental health transport, and intensive care patient transport. Also, non-medical transportation is further categorized into mailroom services, event covers, medical repatriation services, courier services, and others. Some of the end-users of healthcare transportation services include private paying customers, hospitals, medical centers, nursing care facilities, and airport shuttle. The segmentation by state comprises the current and forecast demand for the U.S. with further state-level division into Texas, Alabama, Massachusetts, New Jersey, Washington, and rest of the U.S. The competitive profiling of noticeable players of the U.S. healthcare transportation services market includes company and financial overview, business strategies adopted by them, their recent developments, and product offered by them which can help in assessing competition in the market. Key players included in the report are Logistic are Solutions LLC, ProHealth Care Inc., Mercy Health Medical Transportation LLC, Molina Healthcare, Inc., Express Medical Transporters, Inc., Aramark Healthcare Technologies LLC, Crothall Healthcare Inc., MTM, Inc., Acadian Ambulance Service Inc., Mobile Care Group Inc., Medspeed LLC, WellMed Medical Management Inc., American Medical Response, Inc., Lyft, Inc., and Uber Technologies, Inc., among others.